As a traveling high school, we find ourselves completely at the will of time. Trans-Atlantic flights across multiple time zones cause the days to blend together, and the anticipation of a new destination can all but make the hands on a clock stop. Yet I don’t think any of us at THINK Global School were prepared for how quickly our first graduation ceremony snuck up on us. Looking back to 2010, we don’t think anyone quite knew what to expect. We were launching the world’s first traveling school –12 countries in 4 years– and like the launch of any new school, for every constant there were three or four unknowns; it was an exciting and slightly unnerving time. When the staff and fifteen students arrived in Stockholm full of enthusiasm and ideas, it became clear that everything was going to work out. Though young and often times bashful, the students took to their new surroundings and experiences with zeal. That first year we traveled from Stockholm to Sydney to Beijing, and whether dog sledding, playing the didgeridoo with Aborigines, or practicing Tai Chi, they seemed to embrace every experience. What’s more, they had embraced each other. 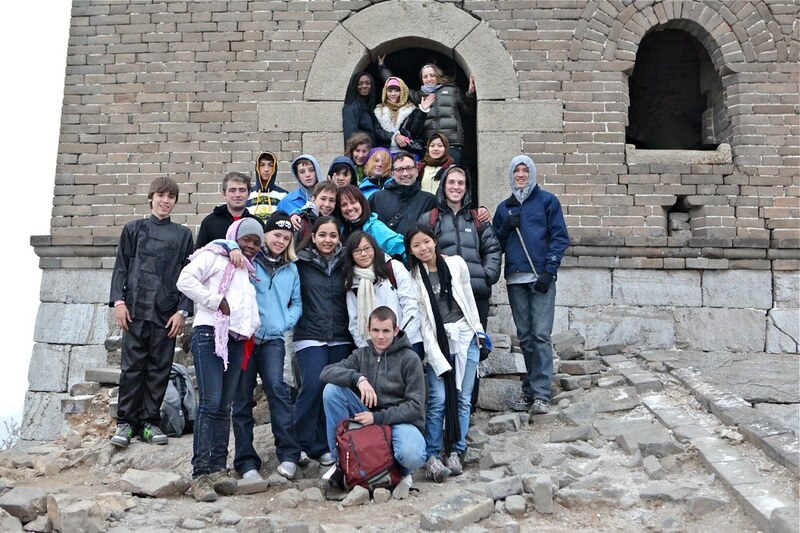 Students and faculty gather at the Great Wall of China. Pema, who joined us from Bhutan, was able to successfully overcome her fear of heights by riding the 236 feet tall Prater Tower swing ride in Vienna, Austria. Ahmad, who joined us from landlocked Afghanistan, had never swam prior to joining TGS. His fears were conquered when he took the plunge into the Pacific Ocean while studying biology in the Galapagos Islands. Cameron, an Australian that arrived in grade 10, developed the confidence to stand in front of a group of people and deliver a speech, whereas previously he had felt he couldn’t express himself. When you see how our students interact with one another, it all begins to make sense. They are the embodiment of a family, endlessly shouting on words of encouragement or making small sacrifices to benefit one another. Our moveable community requires the development of that spirit in order to stay strong, stay open, and keep pushing forward with each new challenge. That’s why, for this year’s senior trip, we wanted to do something truly special, something that would require our students to lean on one another, to champion their strengths, and overcome their weaknesses. We wanted them to be fully aware of the incredible lengths and heights to which they’ve “climbed” in four years on the road, to know of that which they are capable. That challenge turned out to be climbing Mt. Kilimanjaro. Kilimanjaro, like any challenging summit, requires a significant amount of preparation before climbing; some marathons runners have claimed that climbing Kilimanjaro, Africa’s tallest peak, is the hardest thing that they’ve ever done. However, with all that our students do, finding time to prepare proved tricky. In the weeks leading up to the climb, our graduating seniors had to prepare for their final exams, sit the exams, travel to Tokyo for a week-long field trip, and graduate — no easy feat, even for the most disciplined. So they trained when they could, testing their grit by making use of the hilly terrain that surrounds Hiroshima for hikes and conditioning. And after diplomas were presented and goodbyes were exchanged with their underclassmen, our graduating seniors set off for the one continent that had eluded them: Africa. Our climb began in the town of Marangu, a popular starting point for climbing in Kilimanjaro’s foothills. For the next five days, everyone climbed through rainforests, moorlands, alpine deserts, and what seemed like the surface of the moon. As we steadily made the trek up, the change in oxygen availability became readily apparent. All of the symptoms of altitude sickness were there: fatigue, nausea, and in one case, hallucinations, were determined to slow down our pace and break our spirit. True to form, the students banded together like a family, offering words of encouragement to those who were struggling. And after four long days of shuffling along and swearing that they’d never eat a Clif energy bar again, thirteen of the students made it to Gilman’s Point, 18,650 feet above sea level. After descending the mountain, it was time for the students to say their goodbyes. Each of them was able to leave Africa with the knowledge that they’d accomplished something very real — not just by climbing Kilimanjaro, but everything that had occurred in the four years since that first term in Sweden. 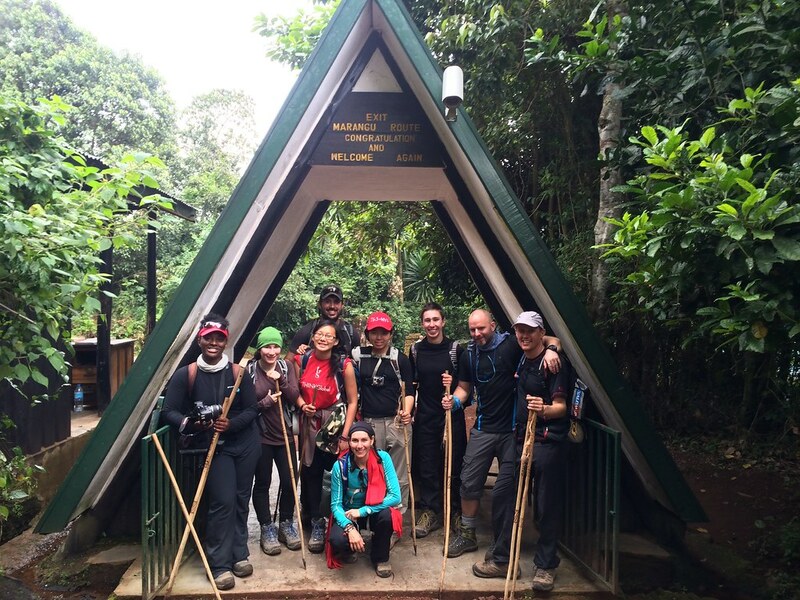 A’ntonia, Bailey, Charis, Yada, and Mark with staff at the end of the climb. In just over a month, we’ll welcome the next crop of students into our tribe of academic nomads. While they won’t have the opportunity to wander the halls of our host school or a museum with the fifteen graduates, they’ll no doubt encounter their contributions at every turn. For without that pioneering first class, there would be no THINK Global School, no world traveling teachers and students experimenting with a combination of the International Baccalaureate Diploma Programme, education technology, and travel. We will always have so much to discover as a school in the combination of these three realms, but our great students give us the inspiration and the assurance that these efforts toward educational innovation reap wonderful results.